4Videosoft DVD to iPad Converter is a professional DVD iPad Converter software, which enables you to convert DVD to iPad, even rip DVD to your iPhone, Apple TV and support MP4 video format. You can import certain titles or chapters and convert them to iPad format with selected audio track and subtitle. Now it has 6X faster conversion speed with NVIDIA??? CUDA??? and AMD APP technology. Convert DVD to iPad, rip DVD to your iPhone, Apple TV, support MP4 video format. 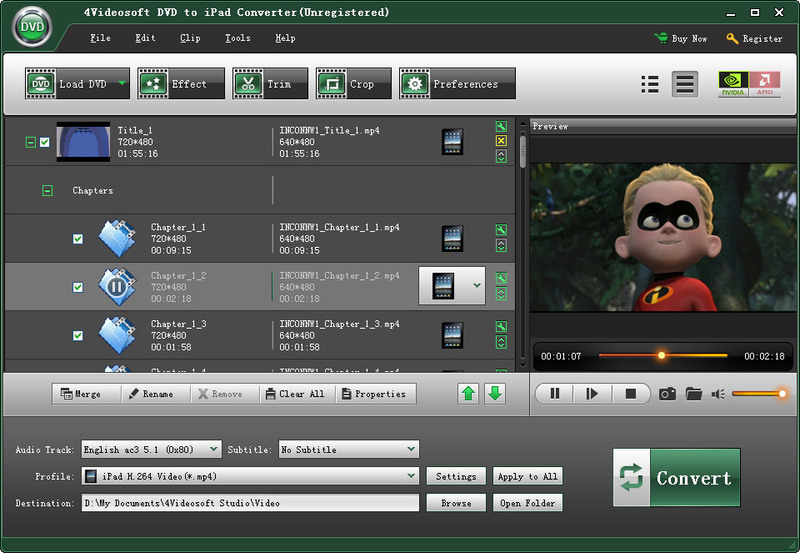 ...... DVD to iPad MP4, H.264/MPEG-4 AVC(.mp4), MOV, and extract the DVD video to MP3, AAC, M4A, AIFF, WAV. The DVD to iPad converter can convert DVD movies to iPad video formats or extract audio track from DVD and convert to iPad compatible audio formats. Get any time-length segments by setting the exact time, adjust the size of DVD movie play region and the output aspect ratio to get the perfect playing effect with this powerful 4Videosoft DVD to iPad Converter. Qweas is providing links to 4Videosoft DVD to iPad Converter 5.1.10 as a courtesy, and makes no representations regarding 4Videosoft DVD to iPad Converter or any other applications or any information related thereto. Any questions, complaints or claims regarding this application 4Videosoft DVD to iPad Converter 5.1.10 must be directed to the appropriate software vendor. You may click the publisher link of 4Videosoft DVD to iPad Converter on the top of this page to get more details about the vendor.